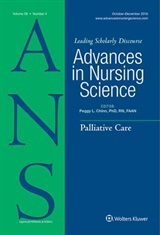 Our currnet featured article is title “Exploring Preterm Mothers’ Personal Narratives: Influences and Meanings” by Cherie S. Adkins, PhD, RN and Kim K. Doheny, PhD, NNP-BC. This is an exemplary project focusing on caring in the human health experience, encompassing nursing’s dedication to a wholistic view of that experience. Visit the ANS website while this article is featured to download the article at no cost! Here is a message hat Dr. Adkins provided for ANS blog readers! was a dearth of research designed from the perspective of preterm mothers themselves; this gap inspired me to conduct the narrative inquiry study reported in this article. I trust the lingering effect on those who read this article is that each mother of a former preterm infant has a unique, meaning-filled narrative about her mothering experience that needs to be heard and understood.